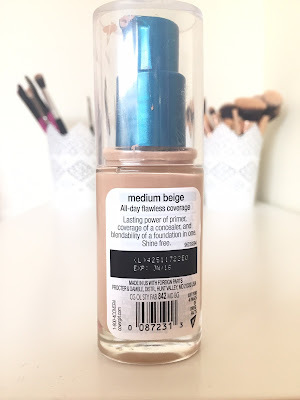 Im back again with a foundation first impression! I have done a few of the now. One on the Loreal 24Hr matte foundation and one on the Maybelline matte + poreless fit me foundation . I really enjoy doing these so I might make them a regular blog feature! 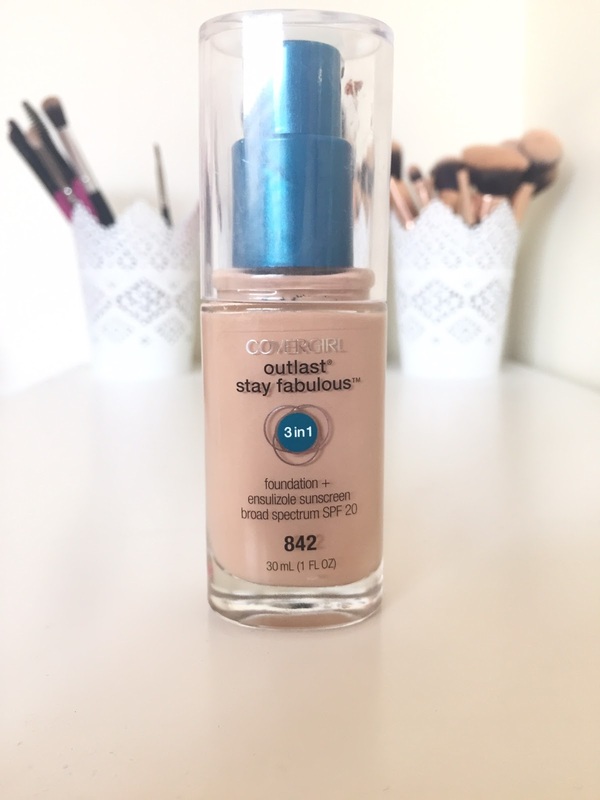 During the Priceline 40% off sale I picked up the Covergirl Outlast Stay Fabulous 3 in one foundation. I have nerve tried a Covergirl foundation before so I thought what better time to try than now! As usual, I tested it out on a day that I was going to work as I am always running around like a mad women. Its a good time to test out the durability of products! I love that it comes in a pump bottle! Its much easier than having to pour the product from the bottle. I always use the same foundation brush when I test out foundations. Once I have pumped out on and a half pumps onto my hand I just apply the foundation in little dots over my face and grab my flat top foundation brush and blend away! It blends out really nicely. As its not a "matte" foundation the product does stay a tad wet on the skin. It sets nicely leaving the skin feel dewy to touch but it doesn't look shiny. It gives high coverage, my forehead was a tad sunburnt and it covered up the red really well on its own. Its also covered up the small spots I have on my chin. It doesn't feel thick or heavy on the skin, it feels really comfortable. now off to work I go! After a busy day at work I was really surprised at how well the foundation held up! My face has very minimal shine, and it doesn't feel thick or heavy like some foundations can start to feel. It has come off my nose slightly but that could also be due to having dry flaking skin on my nose from the sunburn :( It hasn't separated on any other areas. The coverage still looks good too! there are a few little bumps showing on my cheeks but thats about it. There is no transfer when when I pat my face, which is another surprise! I am so happy with this foundation! Its definitely held up to its claims. considering it isn't a foundation specifically for oily skins it really has kept the shiny look at bay. I will definitely be re-purchasing this! It may very well be my favourite drug store foundation as of yet. What did you think? Comment below and let me know! Thank you for reading! Yep its now my daily go to foundation:) I need more colours for when I tan! Priceline 40% off mini haul | what did I get?